This photo was taken in the morning about 3 weeks back. 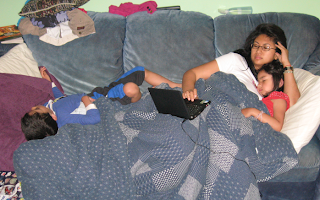 Lam was still sick from the flu, so he and I had slept in the family room on a high state of Barf Alert. I woke up earlier than usual because I has such crappy sleep. Lam had insisted I sleep on the couch with him, which was wicked uncomfortable. Anyway, I started to do some surfing and blogging. Mini then woke up and came downstairs to join me on the couch for a cuddle and a quick snooze. Roomie, who was walking around in the kitchen getting ready for work, took the picture. You know, the fluffy bunny version. What are they doing? Are they working hard? Oh, the life of a blogger... to the untrained eye, it looks like relaxing on the chesterfield with pillows and blankets. But the expert knows better! And are those your pants on top of the chesterfield on the left hand side? Are you doing your work walang pantalon again? you all look so comfortable. practicing their sleeping in skills for summer vacation? you're all sleeping with your hand on the laptop? I love it!! Cozy cozy. The answer is now in the Updated post! No, I don't ever blog walang pantalon... anymore! ;) Those were Roomie's shorts that need mending. They still need mending as we speak. You know, I haven't gotten into WoW... even the fluffy bunny version ;) ... weird.